Don’t you find that our world gets more impersonal as the years go by? It seems wherever you go you are increasingly treated more abruptly and without concern for who you are as person. 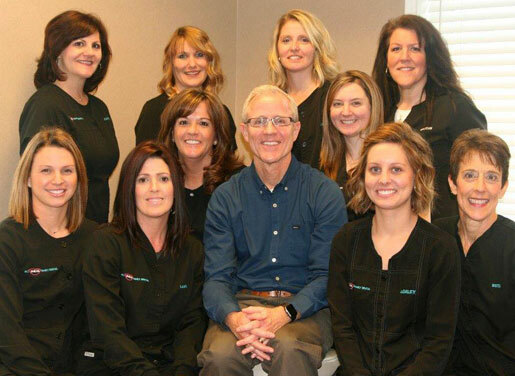 Dr. Nymberg and his staff still subscribe to the notion that trust and comfort come from personal relationships. Relationships are built on open conversation and active listening. Dr. Nymberg makes a point to personally call every patient after treatment to check on their comfort and to ensure a successful outcome. He also offers his cell and home phone, so help is just a call away. It may also comfort you to know that our staff has worked together an average of more than ten years! That may give you a hint about the friendliness of our work environment and the experience of our crew. We are proud to have a wonderfully diverse patient population. All are welcome here. Are you nervous going to the dentist? Dumb question, but it raises a very important topic—the nearly universal fear of going to the dentist. The issue is often swept under the rug in the dental field. Our approach is to acknowledge this reality and take it head on. How? First, we carefully cultivate genuine relationships with each of our patients—we know them, they know us—before proceeding with treatment. There is greater comfort working with someone you know and trust. Although we'd like to think our charming personalities are enough to make people perfectly at ease; in truth, it often requires more. Therefore, each one of our eight treatment rooms is outfitted with a TV screen that feeds cable programs and DVD movies. The TVs and the chairside headphones provide an entertaining distraction from unwanted sights and sounds. In addition, we offer the calming effects of laughing gas (nitrous oxide) via two mobile units at no charge. For those who need that final layer of “distraction,” we may prescribe Valium to be taken before the appointment, and is often used in addition to the laughing gas. It can be confusing and a bit unsettling to have to rely on multiple offices for care in our world of specialists. At Dr. Nymberg's office, we are able to provide the entire family nearly everything they'll need under one roof—braces and root canals included. We even have a wonderful kids' area with Wii, books, and puzzles—they'll love it! It's comforting to know that you can receive most of your care in one trusted, familiar place. In our hurried lives, convenience is king. The economy in recent years has made us all a lot more cost conscious, which is a good thing. Because we consider our primary mission to be one of service, we are less interested in maximizing profits. Therefore, we deliberately set our fees at or below industry norms. Our intent is to allow access to the very best care available to the largest number of people. We believe we provide a terrific value while never compromising our high standards. We use the incredibly sophisticated and precise CEREC® CAD/CAM system which allows us to create a crown at the same time as the appointment! So, no second appointment with Novocain, no temporary, no waiting for weeks for the crown to be placed, and a better fitting and looking crown than ever before possible. How many of us are “long in the tooth” with receded gums that are unsightly and result in cold sensitivity on the root? Most adults can probably relate to this phenomenon. This condition has traditionally been treated with gum grafting—a painful procedure which relies on removing tissue from elsewhere in the mouth and suturing it over the exposed root. Recovery is prolonged and painful, and the results are less than ideal. As a result, most dentists and patients just ignore the condition, which then worsens over time. Dr. Nymberg is certified in the latest Pinhole Surgical Technique—no scalpels, no gum grafting, no suturing! The results are nearly immediate and lasting. The Diagnodent laser cavity detector, approved by the FDA and the American Dental Association, is currently the most accurate method of detecting cavities in the grooves of non-filled teeth. It safely and quickly measures for the presence of a cavity in its earliest stages. It greatly minimizes the possibility of improper diagnosis inherent in other methods, so the doctor and patient can be supremely confident in the information it provides. Consequently, a tooth can be filled more conservatively and with greater confidence when using this technology. Who isn’t concerned with over-exposure from X-rays in a healthcare setting? Dr. Nymberg is sensitive to this concern and insists on only taking X-rays when necessary, and then using digital X-rays to use least amount of X-ray radiation possible. Digital X-rays take advantage of special sensors that require minimal amounts of exposure. The images are available immediately, require no hazardous developing chemicals, and are neatly stored in the patient’s computer file. He also uses X-ray units that produce low amounts of rays with minimal scatter, so every patient can feel confident that exposure is at the lowest possible levels. As a precautionary measure, we also use lead shields with thyroid collars for an added layer of confidence. In addition, each room is equipped with an intraoral camera. Live images of patients’ teeth are captured and stored in their digital file. The patient can then be shown conditions that exist in their mouth as the dentist sees them, so they can more easily understand Dr. Nymberg’s recommandations. Computer-generated graphics are used to show what each procedure looks like so that you can have a much clearer understanding of treatment suggestions. There is now no reason for confusion or doubt when it comes to understanding and discussing treatment recommendations. Dr. Nymberg’s office is fully computerized so patient information is safely and conveniently stored digitally. This allows us to seamlessly reproduce records, access information quickly, and send needed information off to specialists with the click of a mouse. In addition, insurance claims are sent digitally to insure rapid return of benefits. Our office also employs state-of-the-art communication using Sesame 24-7™, a special software that allows appointment reminders to be sent via email, patient access to their financial and appointment information, and the ability to securely pay balances online. Talk about convenience and unprecedented patient access! Yes, there's a lot here. Then again, we believe there is a lot that sets us apart. There is one way to see if this is true—come see for yourself. We invite you to spend time with us to see if we are a good fit for you. If you are interested, call our Mason dental office at (513) 398-5030, or schedule an appointment online.